As many as 10 people are trapped under snow after an avalanche occurred in Khardung La on Friday. 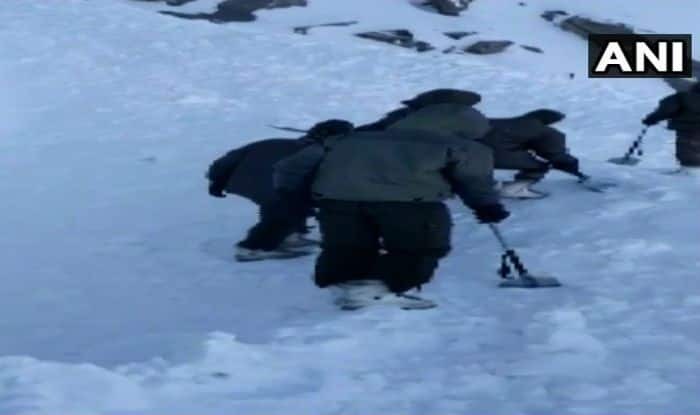 Ladakh (Jammu and Kashmir): Of the ten people trapped under snow after an avalanche in Khardung La on Friday, five bodies were recovered, reported ANI. Two tippers and a Scorpio car, which were carrying a total of 12 people, left for Khardung La this morning to load snow which was to be brought to Leh. A tipper had been loaded with snow while the other one was being filled with the same when the avalanche struck. Reports said rescuers from the district administration, police and the State Disaster Relief Force are at the site, which is 40 km from Leh town. A search operation is currently underway Further details of the incident are awaited. On January 13, a medium danger avalanche warning has been issued for higher reaches of Baramulla, Kupwara, Bandipora and Ganderbal districts while a low danger has been indicated for Poonch, Ramban, Kishtwar, Anantnag, Kargil and Leh districts, but it was only for the next 24 hours. “Medium danger avalanche warning has been issued for higher reaches of Baramulla, Kupwara Bandipora and Ganderbal while as a low danger for Poonch, Ramban, Kishtwar, Anantnag, Kargil and Leh districts, for the next 24 hours,” an official said. Earlier, on January 3, an avalanche in Jammu and Kashmir’s Poonch left one Army jawan dead and another injured, news agency ANI reported on Thursday.